~ Boulder Bach Beat hopes to stimulate conversations about the ways Bach’s music succeeds in building bridges between populations separated by language, culture, geography and time. In general, I listen at home on my big speakers. When in transit, iPhone with headphones. On the road, via satellite radio tuned almost entirely to 90’s on 9. Radio 3 until once they played Hindemith saxophone music and I had to take a month off. Via iTunes, Tallis: Ave, rosa sine spinis and Other Sacred Music, recorded by The Cardinall’s Musick and Andrew Carwood. If you found yourself with six months free to learn a new instrument, what would you choose? The oboe! Although one gathers it takes somewhat longer than half a year to get past the painful parts. Is applauding between movements acceptable? Sure, why not? Or maybe you should be tried at The Hague for it. I don’t know. The press have decided to invent some great crisis about applauding and I’m not entirely sure why. You know what’s scary? Going to the jazzzzzz clubbbbb. I have no idea what to do, when to applaud, how to grow my facial hair, when to stroke it etc. Go bother them about elitism and audience participation for a few years and let us get on with our work here, then let’s check in. What single thing would improve the format of the classical concert? I’ve always thought that in England particularly, it would be great to have a free program, particularly at the opera. It’s never struck me as being a £5 question to know who that lovely tenor was, or, indeed, to remind me of the basic plot of something fussy like La Forza del Destino. Even a simply printed thing would be, I think, useful; it doesn’t need to be glossy or have commissioned essays. What’s been your most memorable live music experience as an audience member? It hasn’t happened yet in the concert hall – for me, the sublime is attained on a random Tuesday, at a sparsely-attended evensong somewhere, with an Orlando Gibbons verse anthem being sung almost perfectly. What was the first ever record you bought? Lol, “record.” I think it would have been Different Trains, by Steve Reich, in 1992. It was a CD. Do you enjoy musicals? Do you have a favorite? I have a particular obsession with Sondheim. Into the Woods is a triumph in every way, and I live for Merrily We Roll Along. How many recordings of the Goldberg Variations do you own? Do you have a favorite? I own the world’s most fantastic collection of the Goldberg Variations (BWV 988) played not on the keyboard. Violas da gamba, reeds, accordions, harp, you name it. One of the things about Bach is that once you start ignoring the performance practice crazy people, with their orthodoxies and internecine cattiness, you realize that Bach works despite a saxophone arrangement. That having been said, I put on Slow Late Gould when I am feeling self-indulgent and Fast Early Gould in moments of controlled mania. If Wendy Carlos got her act together and made a recording I would buy it in one second. Which conductor of yesteryear do you most wish you could have worked with? I think I would have to say Pierre Boulez, even though he is still, at the time of this writing, quick. I’m obsessed by his Stravinsky recordings: how he teases out the brittleness and brightness of the woodwinds. I have a recording of the Symphony in Three Movements with Chicago that gives me chills to this day. Which non-classical musician would you love to work with? James Blake. I keep on telling English papers to tell him to call me and nobody is making it happen. Also those boys from Disclosure. I’m leaving this in your hands now. Imagine you’re a festival director here in London with unlimited resources. What would you program – or commission – for your opening event? The revolution didn’t pan out – commercial forces commodified jazz, cosseted classical music into plush escapism, and ensured a long estrangement between pop and the avant-garde. But La création du monde still shouts an objection with atypical style. “I don’t need to go into the shop, Chas,” replied Mick in droll Cockney, “I can hear ’im from ’ere,” which he certainly could – a restlessly remarkable, eerily savage sound emanating from within. 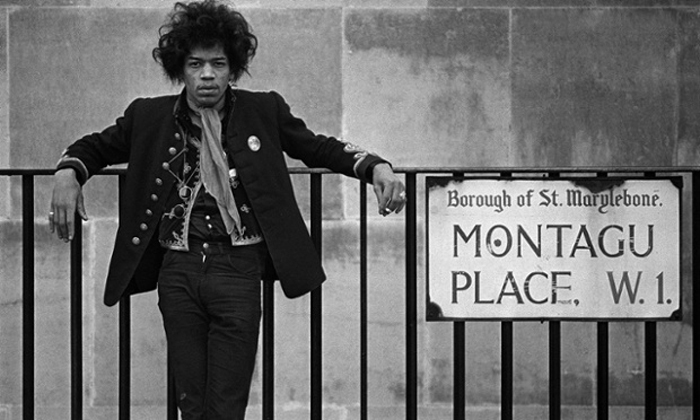 This was the afternoon of 22 September 1966, Jimi Hendrix’s first full day in England. Eve’s is one of the many stories not included in the biopic Jimi: All Is by My Side, narrating the life of unarguably the greatest guitarist and blues magician of all time, as he left New York for London. Hendrix had arrived aboard a Pan Am flight, little known in his own country and a stranger to London. He had been born of Native and African-American blood in Seattle to a poor father who cared moderately for his son and a mother whom he adored but barely knew, and who died when Jimi was fifteen. He had joined the 101st Airborne Division of the US Army to avoid a jail sentence for car theft (under a judge’s ruling) but hated the army immediately. A regimental report read: “Individual is unable to conform to military rules and regulations.” It is important, says Paul Gilroy, a historian of black culture, to see Hendrix as an ex-paratrooper who gradually became an advocate of peace. Reared on Muddy Waters and Albert King, music was Hendrix’s love and after teaming up with army colleague Billy Cox on bass, he played for Little Richard and the Isley Brothers before venturing out on his own. This was not serendipitous, nor was it as effortlessly “natural,” as Hendrix himself often suggested, or even pure genius: Hendrix had found an alchemist with sound in the unlikely form of a sonic wave engineer in the service of the Ministry of Defense, Roger Mayer. Mozart, Handel, Bach, Mahler: influences which Hendrix listed in a collection of writings recently assembled by his friends Alan Douglas and Peter Neal to create the nearest we have to an autobiography. And appositely so, for Hendrix’s address in London, which he called “the only home I ever had,” with the only woman he ever really loved, was the same at which George Frederick Handel had resided in another era: 22 Brook St, London W1. Except perhaps Kathy too: Hendrix wrote The Wind Cries Mary, her middle name, when she had stormed out after an argument. Hendrix never made it back to work. He died in the street on which I was born: Lansdowne Crescent, Notting Hill. I’d moved a block away by the time I picked up the Evening Standard on the way home from school on 18 September 1970, flabbergasted by the news. The front-page picture showed Hendrix playing at that Isle of Wight festival less than three weeks beforehand. I’d been there; his searing cry against war, Machine Gun, was still ringing in my ears. Back home, I changed into all white and waited for cover of darkness to go round to 22 Lansdowne Crescent, where Hendrix had died in the basement, swallowing vomit after a night out with wine, amphetamines and a German girl called Monika. There was no one there. I took a piece of chalk out of my pocket, scrawled “Kiss the sky, Jimi” on the pavement and crossed the road to ponder the gravity of the moment and place. A man emerged and washed away my scanty tribute with a mop. Vladimir Ivanoff, head of the Ensemble Sarband, sat down with Deutsche Welle to talk about “Passio” and “Compassio” – about suffering, passion and empathy, all of which play a central role in music and faith. Deutsche Welle (DW) In your latest project, European, Arab and Turkish musicians, instruments and traditions come together. What does the title “Passio-Compassio” tell us? Vladimir Ivanoff (VI) “Passio” translates to “passion” and also to “suffering.” In its medieval sense, “Compassio” means “to perceive” and “to empathize.” With this project, we’re trying to sublimate suffering by way of music, transforming it into mindfulness – mindfulness toward that which is foreign, the other. That’s why we’ve selected a repertoire with a lot of music by Johann Sebastian Bach from his two Passions. We’re pairing it with early Christian music from the East and Islamic music in the Sufi tradition. That means we have music from two of the three major religions of the book – Islam and Christianity. The three predominant book-based religions detail a path away from suffering: going through the tunnel of suffering in order to arrive at salvation. DW How does that function in confronting various styles of music with each other? DW In the project, instruments of various cultures are played, with their widely divergent voices and technical possibilities. How does it fit together? VI That’s the nice thing about art – in it, you can achieve the impossible. We have a jazz string quartet on stage that also performs as a classical string quartet. On the one hand, we have a Western harpsichord, and on the other, the qanun from the Arab and Turkish realms, which has been described as a Middle Eastern piano. Then we have jazz saxophone along with Arab and Turkish long-necked flutes. Then of course – and very importantly – there is one male and one female singer. Mustafa Doğan Dikmen, our male vocalist, is one of the great specialists in classical Ottoman music and sometimes sings Bach in Turkish. The female singer, Fadia el-Hage, is from Lebanon and studied in Germany. The program reflects her own multicultural background. DW “Whirling dervishes” accompany the trans-musical encounters in the project . . .
VI They perform dance-like movements, but they’re not dancers. They’re from the Mevlevi Order, a lay association. Since their youth, they’ve met once or twice a week to dress in ritual costume and swirl to music. The goal is to reach a state of absolute inner clarity. 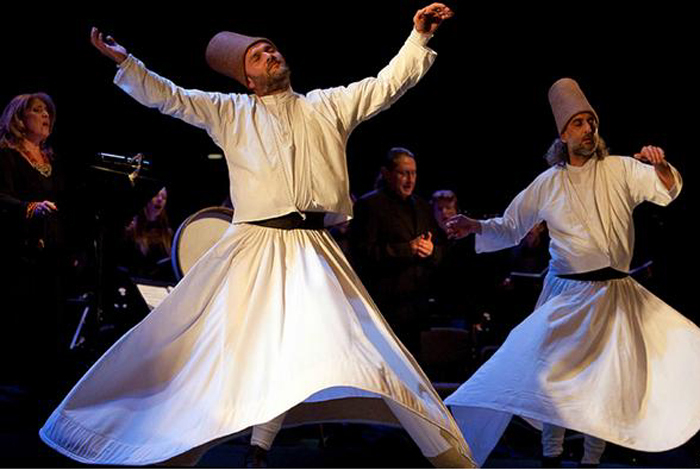 At the concert, these Mevlevi dervishes will whirl twice for about twenty minutes uninterrupted to jazz, Bach and Islamic music. As they swirl around, an indescribable feeling of community ensues – also with the audience. That’s what we’re primarily going for with the project: to create a community of mindfulness over the course of two hours. For me, the dervishes are like satellites of brotherly love. DW So, the message is: mindfulness toward the other – even if the two may not really go together? VI The Orient and Occident don’t really fit together! If they’re supposed to coexist, then you have to make it happen. But before communication can take place, you need mindfulness and acceptance. We cannot isolate ourselves anymore. We can’t simply close the door and say, “Everything is good here, and it doesn’t matter what happens out there.” You have to work toward that. The beginning is easy: perceiving and noticing, “OK, there’s something different.” What happens then is up to the audience and to individuals. Ours is a call to work towards something both on the inside and outside. It’s actually a counter mission to all of these peace, love and blah, blah projects that send the message: “You can all go home now in peace; everything’s fine!” That’s not at all so! This year, I had to fight three months for each individual visa for my Syrian, Iraqi and Turkish musicians. Understanding is not greater. We’re becoming a bastion, closed off toward everything else. Fear is on the increase. Each individual has to do something to try and make things at least more bearable. A design innovation recently displayed at K 2013, the world’s largest plastics trade show in Düsseldorf, Germany, is a prototype for a cello that only remotely recalls the classic lines of the seventeenth-century violoncello. The German polymer giant Bayer MaterialScience has fashioned the futuristic instrument from transparent, lightweight cast resin. 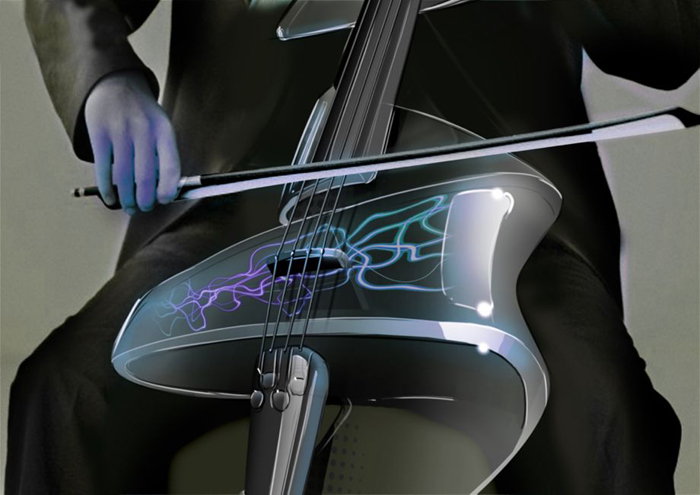 The company’s aim was to encourage aspiring musicians to take up the cello by making what is normally a rather cumbersome instrument easier to play and carry and to entice accomplished musicians by creating a cello body that acts as a blank canvas for a range of optical effects using integrated technology. Bayer MaterialScience assembled a team of designers and lighting specialists to create the ergonomic cello, canvassing both professional and amateur musicians for clues on how to innovate. They found that music students wanted color signals to let them know when they were out of tune or to flash like a metronome to help them keep time; professionals mused about incorporating lighting effects and video into live performances. The design starts with a more-or-less standard electric cello neck and fingerboard into which sound and optical technology is built, from LED lighting to mini video projectors that can display photos, graphics or video on the transparent surface of the cello. The slimmed-down cello belly is then formed from a lightweight material based on aliphatic polyurethanes. The company imagines applying the technology used to make Cello 2.0 to the future design of keyboard, plucked and wind instruments. It has already helped build break-resistant saxophones made from a colored polycarbonate blend, as well as high-gloss polyurethane piano coatings. The jazz pianist Dan Tepfer first heard Bach’s Goldberg Variations (BWV 988) when he was a teenager and a friend played him a recording. He was instantly awe-struck by the music. He also recognized in Bach a fellow spirit, a fellow improviser. Mr. Tepfer, 31, a busy jazz artist who has performed and recorded with giants like the saxophonist Lee Konitz, told this story to an audience at Le Poisson Rouge, the Greenwich Village club, on Thursday night, 12 September 2013. 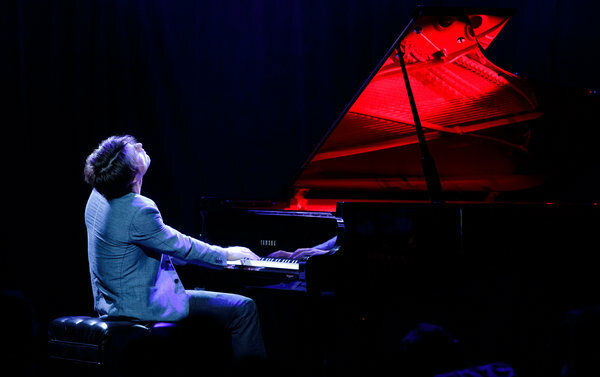 He then performed his signature version of Bach’s monumental work, Goldberg Variations/Variations by Bach/Tepfer. 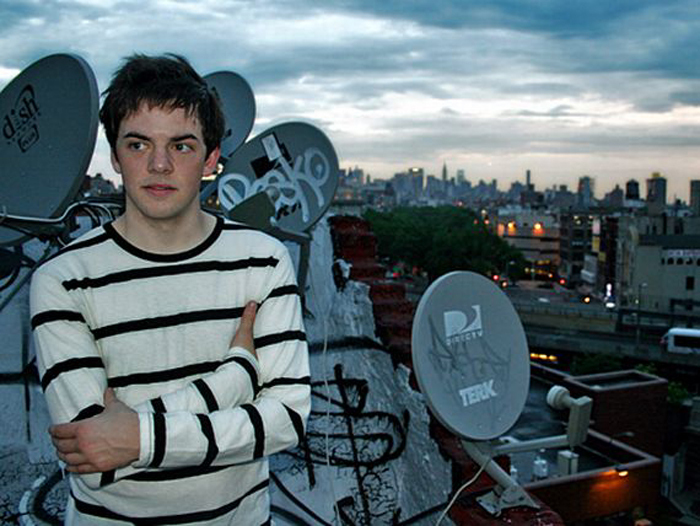 He recorded it in 2011 on Sunnyside Records. Bach’s keyboard masterpiece is written in the form of an alluring aria with thirty variations. In Mr. Tepfer’s riveting and inspired version, after performing each Bach variation, he follows up with his own improvised one that becomes a musical commentary and takeoff on the Bach. “It’s always an adventure,” Mr. Tepfer told the audience. Adventure was the right word for the brilliant performance he gave. Naturally, each time he plays his improvised takes on Bach’s variations, the music turns out differently. He has a basic concept of each one in mind, he said during a brief interview after the concert. But the resulting notes are different, sometimes very different, especially in the slow variations, when “I have more time to think,” he said. As he also explained to the audience before playing, Bach’s work is a set of variations not on a melody, but on a bass line and series of chords (a harmonic pattern). This is close to what jazz musicians do when they play improvisations on a standard, Mr. Tepfer said. They improvise variations over the “changes,” that is, the chord patterns of the theme. I was engrossed from the start of the ninety-minute performance, when he played Bach’s aria with such sensitivity and grace, then brought articulate touch and naturalness to Bach’s jaunty first variation. His improvisation on that variation picked up on the dancing gait of the Bach but made it more jerky and unpredictable. He let his imagination go with strands of syncopated passagework and clashing harmonies. The playful walking bass figure in Bach’s second variation became a galumphing bass line in Mr. Tepfer’s improvisation, with a sassy, biting right hand. Mr. Tepfer’s variations were often bold adventures in modern jazz. Bach’s ninth variation, written as a canon at the third (a contrapuntal technique), became an exercise in soft thick chords with wrong-note contrapuntal inner voices. Bach’s fourteenth variation, a burst of virtuosity that builds to passages where the right and left hands have feisty showdowns of racing turns and spiraling runs, became a gnarly, gnashing and relentless improvisation in Mr. Tepfer’s conception: imagine Bartók as a jazz pianist. The mournful Variation no. 25, which Mr. Tepfer played poignantly, was in his reimagining a soulful rumination: a searching melodic line tries to break free from hushed, piercing cluster chords. This is no stunt, but a fresh musical exploration. Mr. Tepfer invites you to hear this masterpiece through his ears. I bet Bach would recognize a kindred spirit in Mr. Tepfer. The story of Bach’s pen slipping from his lifeless fingers while composing The Art of Fugue (BWV 1080) – which ends in mid-bar, notes hanging in the air – may be apocryphal, but this work will always be one of music’s sacred mysteries. It is thought he began it at a time when his overriding interest lay in the technicalities of counterpoint – how to achieve “natural” polyphony while obeying mechanical rules – and that he went back to it when musical dramaturgy was uppermost in his mind. His son Carl Philipp Emanuel tried to drum up interest in it by pointing out that his father had encoded his name in the unfinished final fugue, but the sheet music didn’t sell and he had to dispose of the printer’s plates as scrap metal. 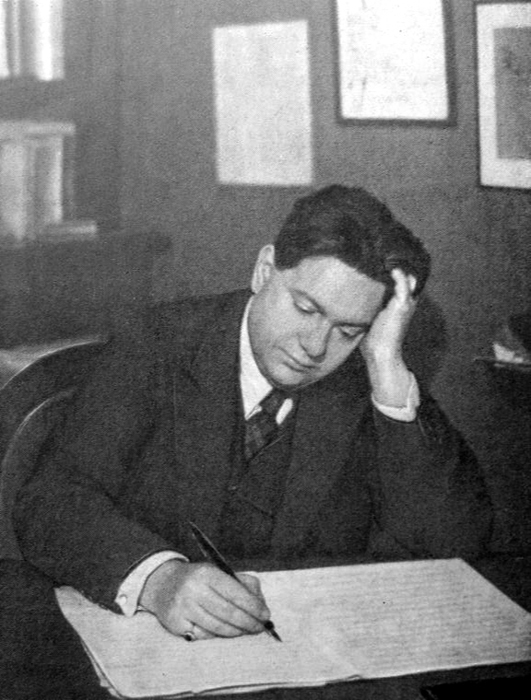 Since then the work has exerted ever-increasing fascination – the Nazis flourished it as being iconically German – and Bach’s keyboard scoring has been trumped by scorings for a wide variety of instruments, including saxophones. If the most successful transpositions have been for string quartet, that’s for two good reasons: these instruments bring out the voices in high relief, and their combined sound can generate the choral effects which Bach was often implicitly striving for. 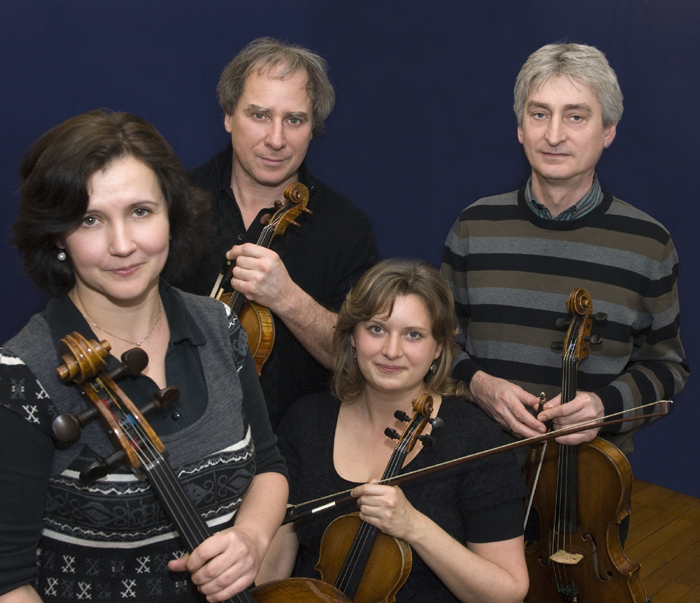 And to hear the Budapest-based Keller Quartet play this work in the perfect acoustic of Kings Place on 1 May 2013 was an unforgettable experience. Any lingering keyboard thoughts were banished in the first few bars by the muscular dissonances and by the sheer glow of their sound, and as each successive fugue added its variation – inverted, back to front, inside out – the structure attained magnificence. The timbre was vibrato-free, the tempi were vivid and varied, and though the sound of Judit Szabó’s cello sometimes stood out as a particular delight, the synergy was ideal. One had the sense, as the four bows finally froze in mid-air, of having assisted at a performance for the gods. Anyone interested can catch this ensemble (with two cast-changes) playing the same work twenty years ago for ECM Records, and with the same poise. Harpsichord as a jazz instrument? Why not? This terrific album of European jazz was tossed into the American slipstream [in 1964], and my family was there to lap it up. My guess is it was the success of The Swingle Singers’ Bach’s Greatest Hits that emboldened Phillips to try out Bach Humbug! Or Jazz Goes Baroque in the United States market. As the title suggests, no music by Bach is used, but Bach’s contemporaries and somewhat earlier composers are mined to wonderful effect. Clearly, George Gruntz, the arranger/harpsichordist, had a good understanding of Baroque music. He mixed jazz improvisation into these classical works with a natural grace and, at times, joyous abandon. Klaus Doldinger’s soprano sax and clarinet, and Emil Mangelsdorff’s flute are full of vitality yet also respect the material. Finally, I can testify to the unexpected power of jazz played on harpsichord. In the early 70s, I encountered a beautifully-maintained harpsichord in a stately British manor, Hothorpe Hall, just begging to be played. I plopped down and played Frank Zappa‘s King Kong, but before long, I heard a howl of protest, followed by a stream of angry words in a Germanic tongue. Apparently, I was profaning the instrument, according to an elderly European gentleman there for a conference of the Lutheran World Federation. 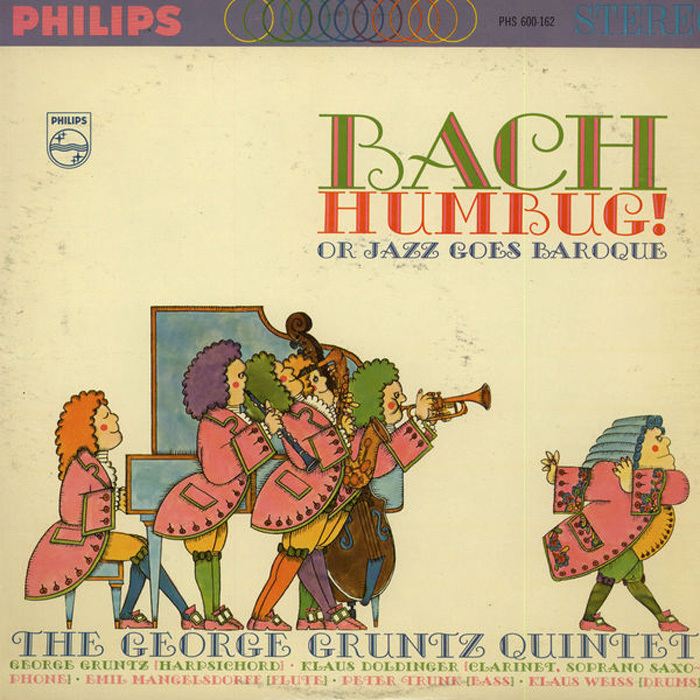 George Gruntz, born in Basel, Switzerland, was a mainstay of the international jazz scene, and he worked with a number of the United States’ finest jazz musicians. He died 10 January 2013.